Morgage lenders scripts and Loan brokers telemarketing scripts. Telemarketing mortgage sales scripts. and Loan brokers telemarketing scripts. Mortgage telemarketers scripts will help you get more leads. Mortgage brokers telemarketers can produce a large number of leads if they are prepared with a telemarketing script for loan brokers. Mortgage lenders telemarketers will lead to increased revenues due to the fact that they generate new business leads. The Mortgage brokers telemarketing scripts & the Loan brokers telemarketing scripts are listed at the bottem of this webpage. Hire a sales-assistant or telemarketer to make prospecting calls. Mortgage lenders & loan brokers have limited time for prospecting for new business and have found it lucrative to hire a telemarketer & sales-assistant to make to make more prospecting calls. Mortgage brokers telemarketing scripts are produced for the purpose of having your sales-assistant or telemarketer call on additional potential customers for mortgage loans or for refinancing their home. The value of a telemarketers mortgage script. A mortgage brokers sales-assistants depends on scripts for their skills to make prospecting calls to a wide range of people with disposable income. Loan brokers revenue is generated from calling prospects to get mortgages. The value of a mortgage brokers sales-assistants scripts cannot be overstated. They need a mortgage lenders script to know what to say to a prospect and how to respond to an objection. Prospecting is a skill that telemarketers and sales-assistants can acquire. Some mortgage lenders cannot master the skills required for a telephone prospecting forcing them to rely on other less effective methods of getting new business. Others spend enormous amounts of money on advertising, direct mail, and passive marketing methods in hopes of reaching the same person by making a prospecting for free. If you had a product that you could call a monopoly you would only need to fill out order forms & count your money. In a business world without competition that steady flow of customers would always be there. Maybe it's time to purchase a sales-assistants mortgage script. Cold-calling is the tried and true methods for getting mortgage loans. Mortgage brokers sales-assistants can use a cold call prospecting script to be more effective when making a prospecting call. It is a rejection-free method for building a lasting image. Cold-calling by loan brokers sales-assistants to build their business in a geographical area must establish an image of trust and ethical dealings. Scripts for a loan broker concentrate on building an image and a good relationship. There is very little that is more intimidating then making telephone cold-call when calling on potential customers that they don't know. There is a difference between the scripts for the mortgage lender and the sales assistant and telemarketer. 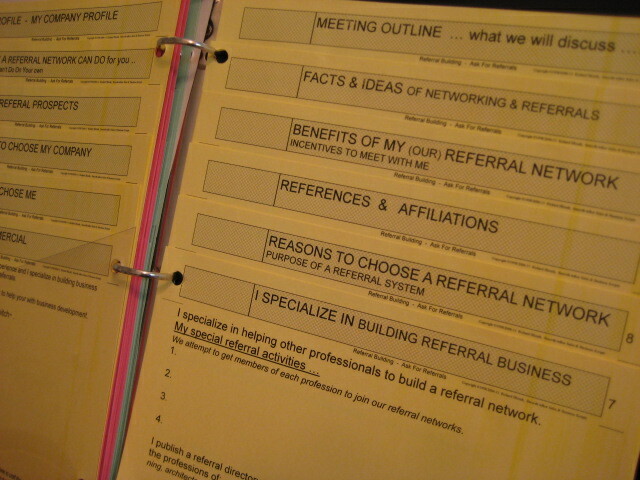 Scripts that are designed for the person who is prospecting for their own potential clients. They are written in the "1st. person singuler." Mortgage Telemarketers scripts are written for those who work for them. For example: "Mr./Mrs. _________ (name of agent) could share some ideas on how you could get the best possible mortgage." *** Note: regarding un-licensed sales assistants & telemarketers. The scripts take great care to assure that they only determine if there is an interest in the services of the mortgage employer and no specific information is discussed. 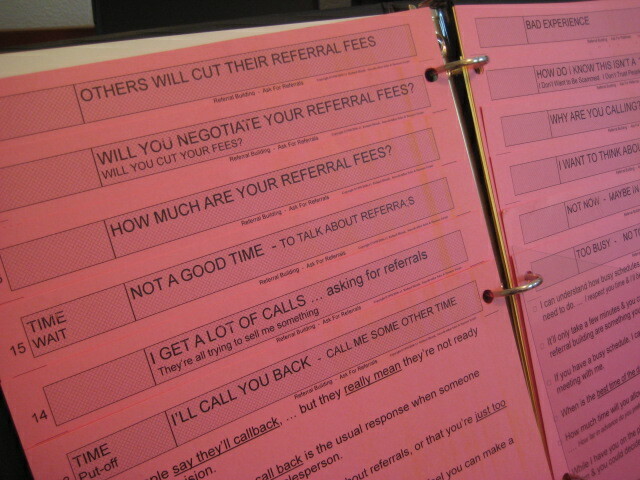 Heading & topics of scripts for the Mortgage telemarketing scripts are as follows. 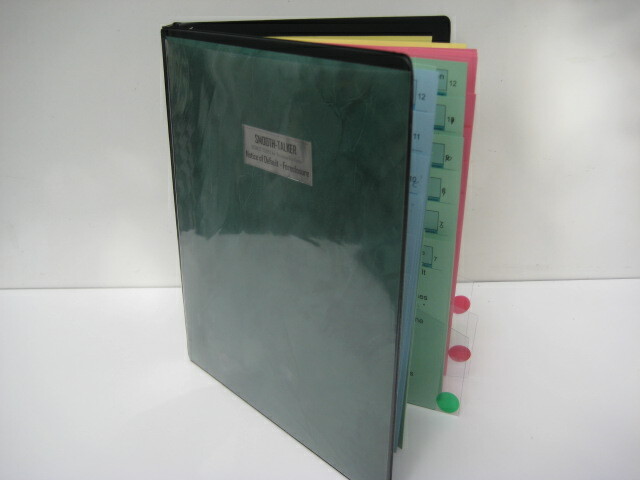 GREEN Total of 24 pages. You are doing the talking, mainly asking questions. 12 pages of Lead-off scripts. The dialogue identifies you, gives a reason for the call, and states a brief selling message. Building our business. Calling potential clients who are likely mortgage customers. Building my client base. Calling clients who may need to re-finance their home. Follow-up call. Previously applied for a mortgage. Old prospect, renew interest. Call to present my mortgage, loan, and banking services. 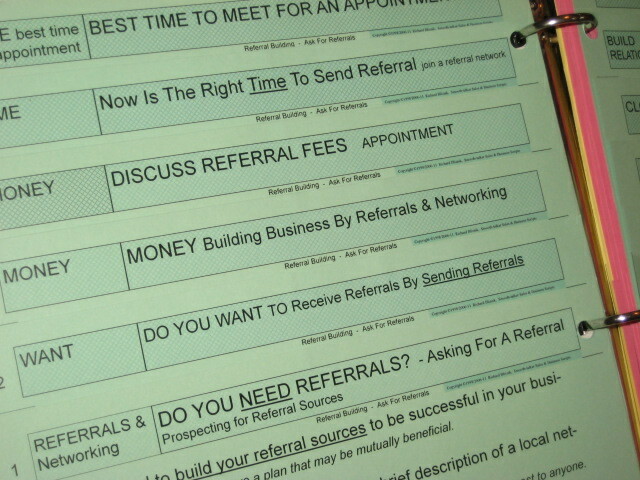 Referral from a person who knows you. Calling early or calling after business hours. 12 pages of the traditional questions you should ask a prospect. Need the services of a mortgage lender. Decision - To apply for a mortgage. Do You Want The Services Of a loan broker. Potential to do business - Motivation. Time - When Will Prospect apply for a loan. Closes - Ask for the order. Money appointnent to talk about finances. Get An Agreement To get a loan With Me. How To Get Mortgage Money. Build Relationships - Take the next step. I don’t have any plans to get a mortgage. Why Should I Choose You? Too Busy - No Time to see you. Why Should I Change Lenders? Non-Committal - I Can’t Decide. You’re Asking A Lot Of Questions. I’ll Think about It - Stalling. Do You Have the best loans & mortgages? Send Information - Tell me by phone. Bad Experience - I’m mad at you mortgage lenders. I can get a mortgage loan for no closing costs. I’ll do business with a friend who is in the business. If you’re so good then get me a loan. I know a mortgage representative in the business. How Much Are Your Fees & Closing costs? I'll get a mortgage through a recommended person. Others charge less closing costs. Wait until the Economy Gets Better. Will You Negotiate Your Interest Rates? Others will not charge an appraisel fee. 30-Second Commercial . Reasons to Choose Me. Lenders Profile - Mortgage Services. Reasons to Choose My Company. My Services - What I Can Do. Resources, Internet, Research, Size, History. Affiliations - Guarantees - References. What a Mortgage Broker Can Do. Benefits of Company. Mortgage Plan I Intend to Use. Telemarketing scripts for mortgage lenders are designed to develop a high relationship with low-pressure. Telemarketing scripts for mortgage lenders seeks to make cold-call prospecting easy because the prospect usually wants to put the home on the market and choose a realtor as soon as possible. Sales scripting for cold-calling focuses on the “service” element. The fact is that they don't have scripts for lenders telemarketing to use to answer questions and objections that prospecting requires. Mortgage training courses and sales training courses teaches us that handling rejection instead of avoiding it is the key to success. It's almost impossible to find good sales and prospecting scripts. Scripts for mortgage telemarketers don't exist. 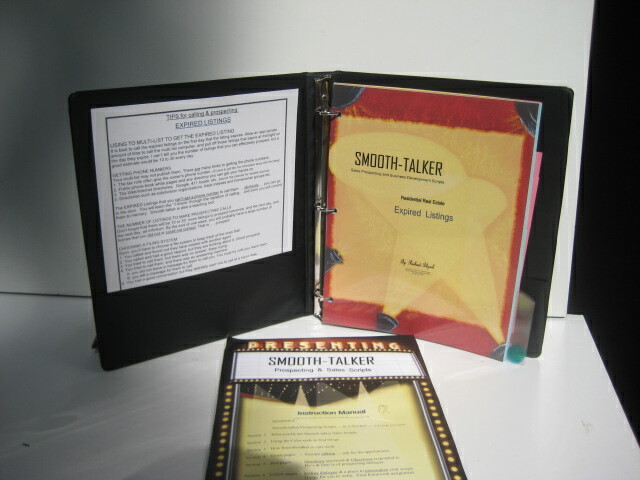 Smooth-talker is reponding to your request for much-needed sales & prospecting scripts and for mortgage telemarketing. 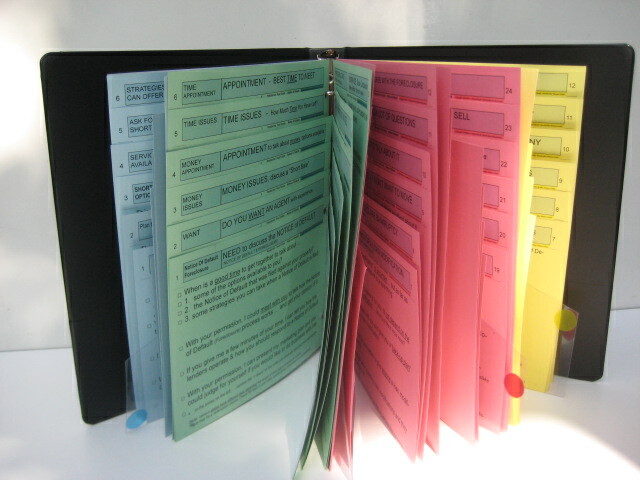 They sometime refer to them as mortgage appointment setters sales scripts.